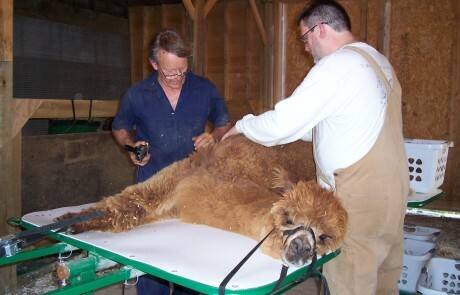 Shearing Day! It comes around every year and requires careful preparation, many volunteers and lots of stamina! In all the hard work and business of the day it is easy to lose sight of the fact that this is your annual harvest and should be treated with great care. 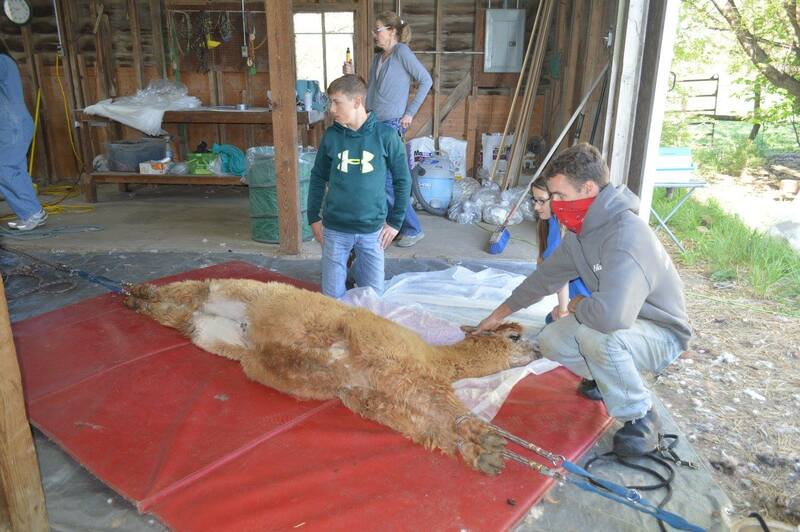 This is the time to examine each fleece to see whether is meets your expectations. 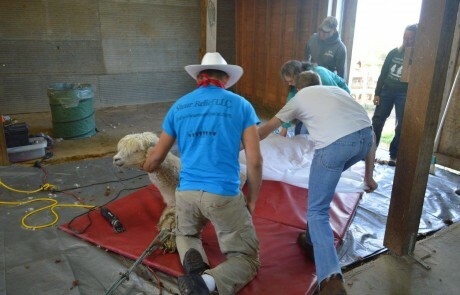 Whether you shear yourself or use professional shearers, whether you use a shearing table or restraints on the floor, how you gather the fleece that comes off the animal is very important to the sorting and grading process and later the processing of your fleece. In an ideal world the alpacas would come to the shearing shed perfectly dry and clean with no vegetable matter sticking to the fleece! But, as we all know, alpacas love to roll in the dirt and no matter how well manicured you try to keep your pastures they will find the burrs that you somehow missed. Do not despair! If they will tolerate the vacuum cleaner, easier on a shearing table, you can get some of the dirt and dust out before you shear. If not, just knocking off the larger bits of hay and removing any burrs you see will be beneficial. The aim of the fiber collection should be to keep the blanket fleece as free from contamination as possible. In many ways fiber collection is easier from a shearing table as the fiber does not touch the floor. Most professional shearers however, use floor mats with restraints and this means sweeping mats carefully between animals and following a color order from white to black to reduce color contamination. As the blanket comes off, it is best gathered onto a plastic or paper sheet so that it stays flat and prevents the cut fibers from sticking together. The sheet should be wide enough so that both sides can be folded over the fleece, again keeping the fleece flat. The sheet can then be rolled into a ‘noodle’ and secured with tape. Each fleece will need to be labeled. Neck and leg fiber can be collected in plastic bags. Again, label each bag carefully. 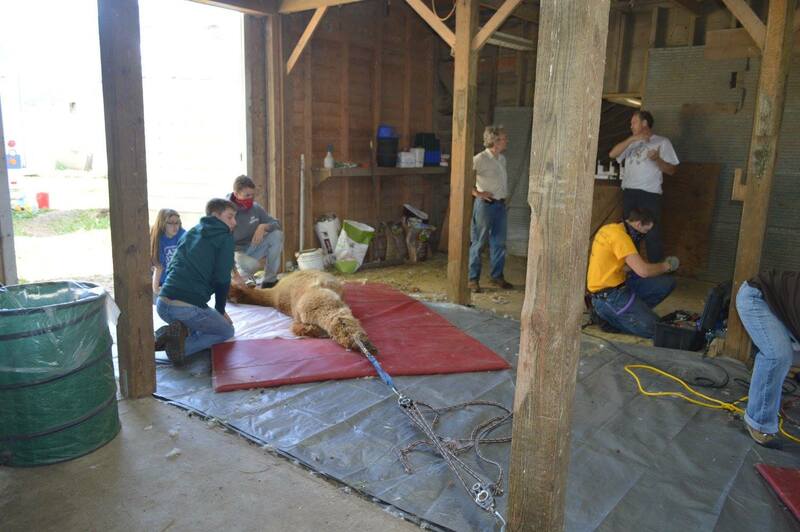 With the fleece securely in it’s noodle you can take your time later to work on each individual fleece.